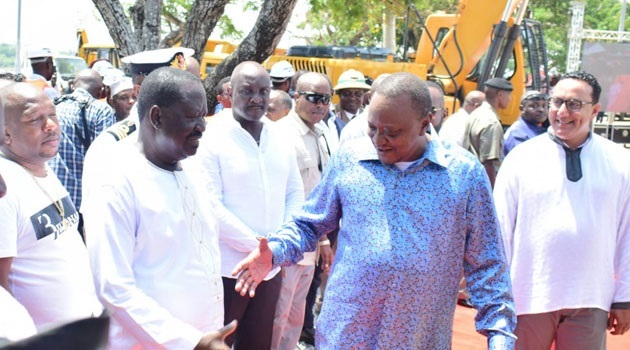 Monday April 15, 2019 - President Uhuru Kenyatta and National Super Alliance (NASA) leader, Raila Odinga’s plan to visit Central Kenya was put on hold last week after intelligence reports showed a possible hostile reception organized by leaders allied to Deputy President William Ruto. The reports which were dispatched by National Intelligence Service (NIS) indicated that politicians allied to Ruto were hell bent on creating trouble during the visit in a well calculated move to portray to other Kenyans that the handshake deal was not welcome at the President’s backyard. The NIS also told the Head of State that he was rapidly losing his backyard’s support to his deputy. This, according to sources, is what made the President order the withdrawal of security for all members of the Tanga Tanga squad from Central Kenya. Tanga Tanga squad is associated with Ruto’s presidential bid in 2022. Its members are Kiambu Governor, Ferdinand Waititu, Nakuru Senator, Kihika Kimani, Bahati MP, Kimani Ngunjiri, Kandara MP, Alice Wahome, and Kikuyu MP, Kimani Ichungwa. The five, according to NIS, were planning to disrupt Uhuru and Raila’s joint tour of Central Kenya. There were also reports that Central Kenya residents were planning to pelt Uhuru and Raila with stones and block some roads to send a message to the President that they were against his handshake with Raila.